Just like humans, dogs want variety too! Try feeding your dog all of our nutritious recipes in rotation without the worry of an upset stomach. 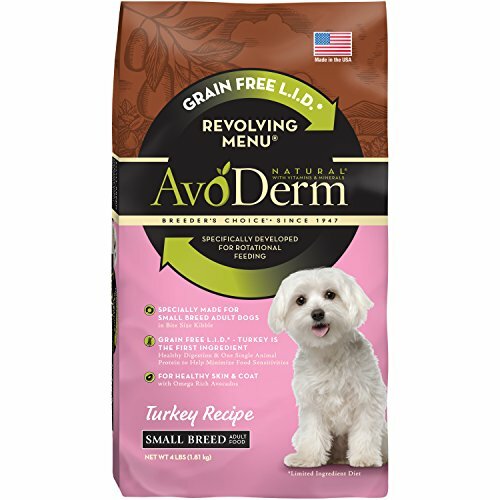 When feeding AvoDerm Natural Revolving Menu dog food you can choose to feed just one recipe or any combination of recipes on the menu. These recipes were specifically formulated for the option of rotational feeding, so you can feel confident about giving your dog “variety.” All our formulas provide healthy balanced nutrition for your dog. High quality ingredients ensure that you are providing the optimum nutrition your dog needs. Our Small Breed Turkey Recipe dog food is grain free and uses turkey as the first ingredient. By using two unique carbohydrate sources, garbanzo beans and peas, we’ve made our recipe grain free and gluten free. AvoDerm Natural dog food is formulated to be rich in high quality fats and oils with a balanced Omega-6 to Omega-3 fatty acid ratio. The right nutrients in the right proportions are indispensable to keeping your dog’s skin healthy. Avocado and avocado oil can help support the skin and coat from the inside out for the protection your pet needs.